In the past, I’ve never been a big make up user. I’ve always used make up now and then but never more than some drug store brands and a little Mary Kay after attending a party and buying too much make up (actually my mom bought it for me). Make up was always fun but something I could never really afford without coupons and going to Walmart. Since I dislike Walmart, I just stopped buying make up. This all changed when Gwen Stefani and Urban Decay collaborated last fall and came out with an eyeshadow palette. I had to have it. I used an appropriately timed Sephora gift card that I received for free through my health insurance company at the time to buy the palette. About a month later her lipsticks, lip liners, blush palette, and eyebrow make up came out. 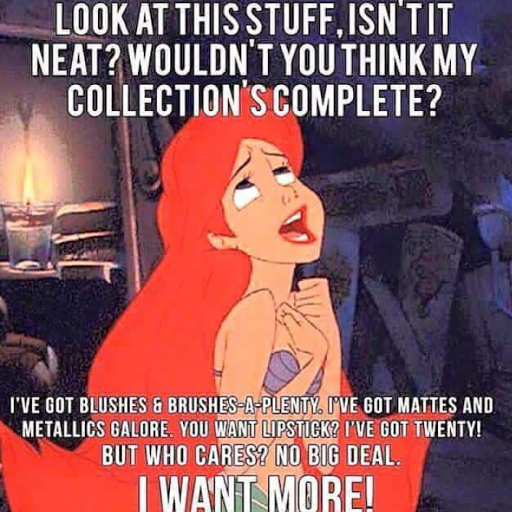 I own most of the collection minus 3 of the lipsticks. The rest is history. I’ve turned into what someone would call a beauty junkie. I’m a total newbie to the make up world, so I’ve been watching many you tube videos and follow many Instagrams and Pinterest accounts for advice, inspiration, and ideas. My poor husband thinks I’m crazy, but the way I see it is that make up is art that I’m not that bad at. Although it is not the cheapest art, especially when you try to stick with the all natural, vegan brands that don’t test on animals and use ingredients you can pronounce. It’s also helped me through the grieving process by giving me something to fill my mind and the times I find myself feeling sad/lonely without my mom. It’s one of those things my mom would love to do as well, play with make up I mean. What are your beauty habits/routines? Are you low or high maintenance? Do you like playing with make up or would rather do without?